Bluewater Bio's HYBACS® installation at Tubli for the 1st phase of the project, which was commissioned in 2013. 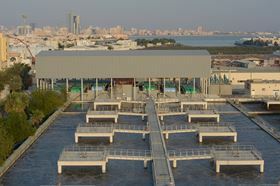 Bluewater Bio Ltd has secured a US$36.5 million contract with Bahrain’s Ministry of Works to further upgrade and expand the Tubli wastewater treatment plant. The UK company will be responsible for all aspects of engineering, acting as EPC contractor and technology supplier. The project is expected to take 22 months. Following completion Bluewater Bio will operate and maintain this new plant alongside another HYBACS plant installed five years earlier. This new project is the company’s second contract with the Ministry of Works at Tubli Bay which will deliver a further 120 MLD uplift in treatment capacity, bringing the total treated to 230 MLD. The project is being funded by UK Export & Finance (UKEF). “I am delighted that we have been engaged to install our technology to further enhance the ongoing environmental improvements to Tubli Bay which is wetlands of international importance and a registered UNESCO Ramsar site,” said Richard Haddon, executive chairman of Bluewater Bio. The STW has a catchment area covering a major tourist destination. Severn Trent Water selects Bluewater Bio’s FilterClear technology for Codsall Sewage Treatment Works in Staffordshire, UK. Bahrain's minister of works and UK ambassador attend unveiling of environmental project.